The Gulf of Mexico oil disaster is man-made. But there can be man-made soltuions to save our oceans. Editor's note: Celine Cousteau is the granddaughter of oceanographer Jacques Cousteau. She is an environmentalist and adventurer and here expresses her opinions on the state of the world's oceans. (CNN) -- Growing up in an ocean family, one has the tendency to pay a little more attention to ocean issues than the norm perhaps. But these days, unless you live the life of a hermit in a cave without access to any news, it is tough to not be aware of what is happening to our seas. Climate change is impacting sea levels; ocean acidification is negatively impacting the calcification rate of critters such as crab, coral, lobster, shrimp; fish stocks are depleted because of over-fishing; and we're destroying many forms of life in the ocean with visible and non-visible pollution's (plastics and chemicals for example). 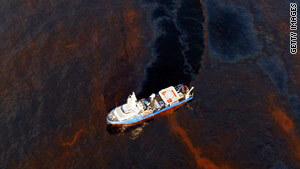 Now we have the Gulf of Mexico oil spill. Carved in my mind is the image of a dolphin and her baby swimming just below a slick shiny layer of oil. I shudder to think of the inevitable collision they face when they come to the surface to breathe. Footage of oily waves lapping at the coastline, remind us that each movement is a death threat to the land, the animals, and the people. It's like watching a bad horror film knowing the protagonist will meet an inevitable demise. Someone wrote in a recent blog that the Earth will recover from this because oil is a naturally occurring element in the environment. We are still able to recuperate from the oil spill and from depleting fish stock but we must act now. This spill however is not a natural occurrence. We did this. We severed an artery and now we standby watching as Mother Earth bleeds out. We try to stitch the wound back together, while others do their best to recover the spilt gold. Maybe Earth will recover, but she should not have been made to. And in the meantime, what happens? We must not only find the solution to the current crisis, we must re-organize our thinking and way of living. We are all responsible for this -- our dependency on oil is a demand for more blood. Until we own up to our individual and collective responsibility for the unending thirst for this resource, we will continuously face similar crises. Of course there are those who are the most obvious to blame for this incident, but we create the demand for the product they provide. Like drug addicts, we fill our syringes to inject the liquid and in the process we pump the Earth dry. In a year someone will remind us of the day the explosion happened, perhaps we will even have built a memorial somewhere. In 10 years we will reference this as a terrible time in our history. Like the earthquakes in Haiti and Chile, Eyjafjallajokul volcano, and Hurricane Katrina, we will eventually move on to other another crisis. But the people who watched their livelihoods ruined, their backyard decimated, and the ecosystem destroyed will not forget so soon. This will not go to the backs of their minds. They cannot just walk away from this. At the center of all environmental challenges are the humans that affect them and those who are affected by them. Are we capable of taking this moment, etching it into our minds, and finding alternatives to our current habits? Are we capable of real change? I watch as people shake their heads at what is happening in the Gulf then without a twitch, hop into a petrol-powered vehicle, buy water in plastic bottles (made from petroleum), and use a plastic bag in which to put some cellophane wrapped produce. At every moment of the day we have a choice. Every decision does indeed count when everyone takes part. We want more, always more. What will it take for us to understand that everything we do, no matter where it happens, is connected to everything else and connects right back to us? When will we really learn that each one of our actions has a reaction. This isn't just about the oil spill, this is about our total disconnect between our attitude, our actions, and the consequences. Many of our plastic bottles end up right in the ocean where we now watch the crude oil drift. In 2008, Ian Kiernan invited me to become Ambassador for the Clean Up the World campaign, which I have been for the past three years. Ian had sailed around the world in 1989 and came back to Australia completely horrified by the amount of visible pollution he saw in our oceans; pollution that ended up there because of us. This is when he decided to create Clean up Sydney harbor and eventually Clean up Australia, followed by the international network of participating organizations making up Clean Up the World. He understood the need to unite people together to create positive change. Now in 2010, David de Rothschild has built an entire boat out of plastic bottles and is sailing the Plastiki across the Pacific. This journey is not just a fantasy adventure, it is a statement meant to bring much needed attention about the undeniable connection between humans and the oceans. The very seas Ian sailed back in 1989, David is now crossing. It is frightening to think about the pollution that is floating out there still and more frightening to think about the pollution we cannot see. From the oceans, we take without mercy, decimating entire species of fish to extinction or the brink of. What we give back is our trash. And then we take some more. We assume we have earned the right to take because we found a way to take. It is high time we not only think about what is important to us, it is time we do something about it. The collective effort is efficient. We are still able to recuperate from the spill, from the depleting fish stock, and are capable and able of restoring places to their natural state. But we must act now. There is no lack of information available to us, there are plenty of campaigns we can join, and there are plenty of organizations fighting everyday that need our support. So put down that plastic bottle and go do something positive for the seas!